For a small business to prosper, it must have local customers — that’s a given. But, successfully carving out a niche in your own community, serving your neighbors, investing in your town and its people reaps incredible rewards. One of the most important aspects of creating a successful small business is building meaningful relationships with your customers as well as other businesses in the community. Ft. Jesse Imaging Center takes this strategy to heart. Although a medical facility doesn’t follow the exact path as a business, in some respects, and depending on the medical service provided, it can be very similar. “We are very invested in the community,” says Melissa Marx, Practice Administrator of the multi-modality outpatient diagnostic imaging center located on Ft. Jesse Road in Normal. Experts agree that reaching out to patients and other community organizations above and beyond the normal “service” provides a way to not only increase public awareness of who you are and what you offer, but also anchors the organization to the community in which you operate. It simply shows you care — not only about the wellness of your patients, but also those people in the community who have not heard of you or used your service. Ft. Jesse Imaging Center is home to the Gale Keeran Center for Women, which offers comprehensive women’s services such as 3D screening and diagnostic mammography, breast ultrasound, breast cyst aspiration, breast biopsy and DEXA (bone density) scans. As part of the effort to encourage women to get their annual mammograms, the Center for Women offers accommodating appointment times later in the evening and on Saturdays, plus offers a comfortable and non-clinical environment in which to have the testing done. Warm capes, short waits, and a waiting room that feels more like a spa cater to women, all so that they feel comfortable while having these diagnostic tests performed. Ft. Jesse Imaging Center is much more than mammograms, however. As a multi-modality center, they offer x-rays, CT scans, MRI, ultrasound, and PET CT (which uses an injection of a radioactive isotope to assist doctors in diagnosing cancer and various disorders including Alzheimer’s disease and other dementia). All of these modalities can be used to diagnose a variety of medical conditions whether the patient is male, female, young, or old. “We encourage consumers to shop around for the best rates,” says Marx. “We accept most major medical insurance plans and Medicare — and our costs are typically half of the cost at a hospital.” The convenience factor of parking close by the door, having an appointment that won’t be delayed due to emergency cases, having same day and next-day appointment options, and quick results all add up to an appealing and smart choice for patients. The Imaging Center holds several special events to give back and help others. Two fundraisers are held annually to help raise money to pay for the costs of providing free mammogram screenings for women who need them. The Annual Breast in Show event is a silent auction on Facebook during the month of October, which is Breast Cancer Awareness month. 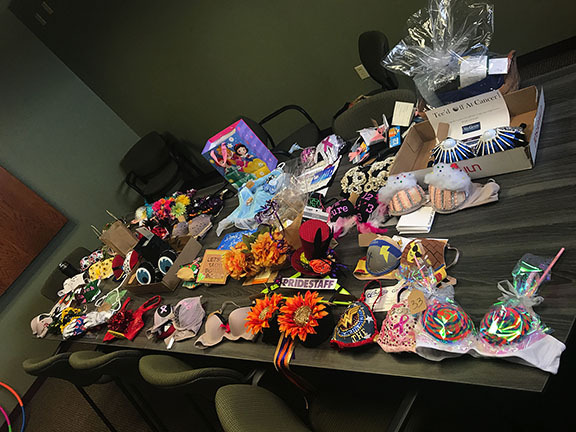 Local physicians and businesses decorate bras in whatever manner they see fit. The bras hang in the women’s waiting room for patients to view. It’s fun for the patients and fun for the participants — and it’s all for a good cause. 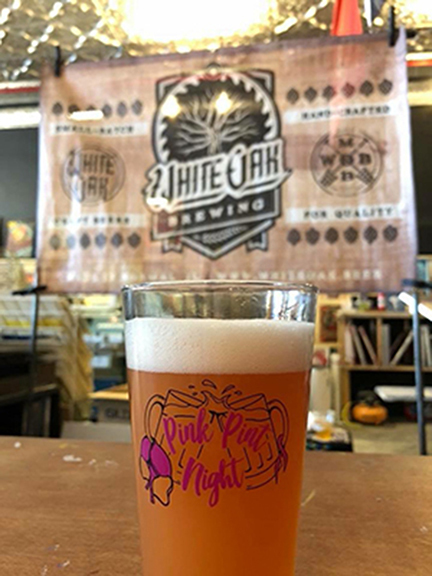 Another event, Pink Pint Night, had its inaugural launch back in August. Held at the Half Hazard Press, a print and design studio dedicated to the craft of making unique and one-of-a-kind items on the square in downtown Bloomington, participants could donate $20 at the door to enjoy beer donated by White Oak Brewing, a small batch, craft brewery located in Normal. Add the local bands who played live music all night and a good time was had by all, and all for a great cause. Funds raised from these events enable Ft. Jesse Imaging to partner with the Community Health Care Clinic (CHCC), which provides medical, pharmaceutical, dental, and wellness education services for people in our community who may fall through the cracks of the local healthcare delivery system. Together they host Ladies’ Day Out, a Saturday event during which women who have been found by CHCC to be in need of a mammogram. The day is full of special opportunities — not just the mammogram screening. The women who attend get pampered with breakfast or lunch, get their nails done, and can enjoy a chair massage. The screenings and the rest of the activities during the day are provided free of charge to the women. It’s a great way to encourage women to have an annual mammogram, and many who qualified in past years still come to this event. Another community fixture that Ft. Jesse Imaging is proud to partner with is the Miller Park Zoo. 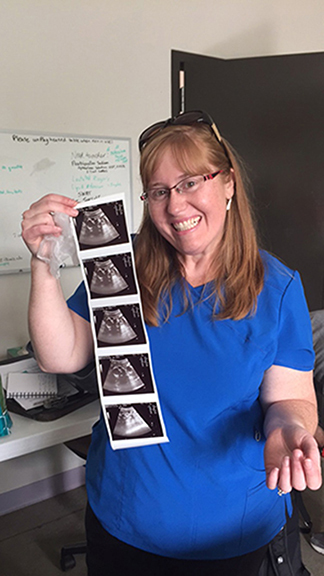 In 2015, Melissa became aware of the zoo’s need for an ultrasound machine. Parks, Recreation, and Cultural Arts Director Jay Tetzloff explained that an ultrasound machine would enable zoo personnel to provide better on-site medical care to the animals when they experienced health concerns or pregnancies. Melissa brought the idea to the Ft. Jesse Imaging Center’s board of directors and in November 2015, the board approved the donation of an ultrasound machine that the Center no longer needed. “It’s a fun way for the entire staff to give back to the community,” says Amy. 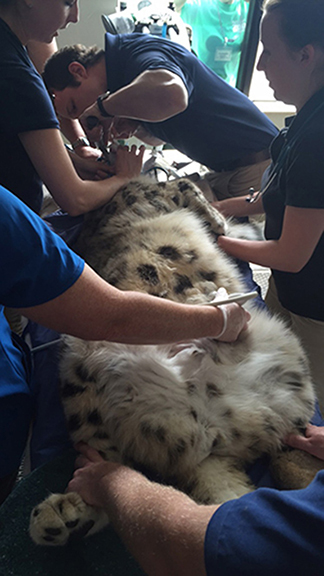 “Our techs get to do the sonogram.” The ultrasound machine has been used for an otter, a red panda, and even the snow leopard. The next generation of radiology techs also benefit from Ft. Jesse Imaging Center’s community involvement. The leadership team at the Center partnered with Heartland Community College to help read and score scholarship applications. Ft. Jesse Imaging also provides a $500 per year scholarship to a student of Heartland Community College’s Radiography Tech program. Students in the program are also welcome to come to the facility to tour and learn about the different modalities. Second year students can job shadow, as well as work at the front desk on an as-needed basis to help check patients in and schedule appointments. “It really helps them understand that side of the business,” says Melissa. Of course, no amount of community outreach would help if the patients who come to the facility do not have an all-around excellent experience. At Ft. Jesse Imaging Center, patient satisfaction scores are always greater than 97 percent, “a phenomenal score for a medical practice,” says Melissa. Patient testimonials frequently commend the staff and technicians for their professionalism, their willingness to go above and beyond for patients who have difficulty doing scans, their friendliness, their knowledge about the procedures, and the quick turnaround of results. And, it makes them feel like they are making a difference in their community — because they are.